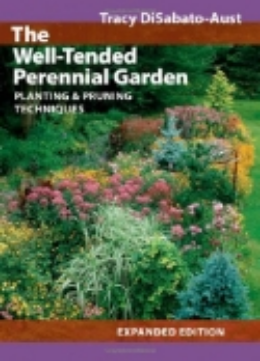 This book has taught me many things I did not know about cutting back perennials, methods for avoiding staking, and producing healthy foliage throughout the season. There are four things that set this book apart from other books on perennials. The first is that this book emphasizes pruning which is unusual and valuable. The second is a discussion of planting and maintenance that is loaded with the author's experience and pictures of her own work. Third, the plant encyclopedia gives cultural information that goes beyond the basics of soil type, zone, and exposure. Fourth, near the back of the book there is a set of pages that serves as a journal for the gardener where he/she can record the pruning and general maintenance that he/she has given to individual plants. Seven chapters are devoted to designing, bed preparation, planting, pests, diseases, staking and division issues. Five more chapters are devoted to pruning, deadheading, cutting back, pinching, thinning, dead-leafing, and winter/spring preparation. The book contains many pictures and diagrams to accompany the instruction provided. The book is organized with general information followed by an alphabetical list of hundreds of plants. They are listed by their Latin name but are cross-referenced with their common name in the index. Each description includes the zone, common name, family, description, size, exposure, and flowering period. I found the encyclopedia section to be very helpful in giving specifics for individual plants, and it contained pictures of the plants discussed. The listing of plants is in alphabetical order by genus/species with the common name listed beneath. This is good; however, for someone accustomed to using common names, it would have been helpful to have an appendix with a cross reference to common names. The description is especially useful if searching for a specific cultivar, especially because the author recommends different pruning techniques for various cultivars. She also indicates good plants for "beginner" gardeners as well as what she terms "high maintenance plants" and indicates methods for creating a successful garden before anything is even planted. At the end of the book she offers a valuable schedule for the growing season. The book also contains three helpful appendixes on grasses, maintenance and pruning requirements. I found the glossary helpful when it was necessary to look up terminology used in the text. This book is different from most pruning books in that it only discusses plants, no trees or shrubs. The photographs are not of glorious gardens to make one drool, they are more illustrative of pruning techniques. A wonderful book, my garden is already the better for it.